Home » Blog » Comments » Conspiracy » Countries » Featured Articles » tours » Travel » ARE THEY UFO WATCHING OVER LA PALMA? 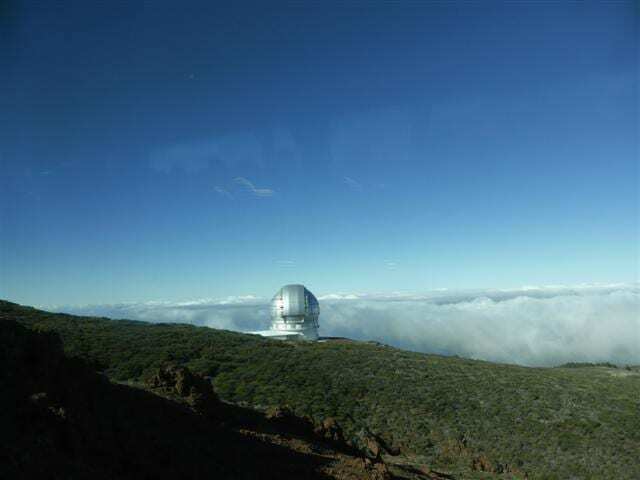 ARE THEY UFO WATCHING OVER LA PALMA? After booking in to our hotel on La Palma, one of the smallest of the Canary Islands, we walked down the road to explore. The sea was full of amazingly-shaped natural sculptures made out of lava, and we went into a small bar to admire the view. There was a couple there, having some lunch and we started talking to them. They were Italian. They’d lived there for 15 years, and the man was the Director of one of the many astronomical telescopes on top of the biggest volcano. I asked him if they watch for UFOs. It’s not what people say that gives away information; it’s what they don’t say. I told him that I wasn’t silly about the subject. I was genuinely interested. He gave me his business card and wrote a number on the back, saying that they’d love to show me round, and to contact this person. Then he followed us outside and gave me a calendar out of his car. I had the feeling that he was dying to tell me more. But why should he? We’d only just met. Our plan was to hire a car and drive up the mountain, until we discovered there are 2,500 hairpin bends curving to the top of the 2,426mts high mountain, where the temperature is around –2C! There’s an astronomical Information Centre/shop along the other way from the hotel, and we discovered that visitors are only allowed to visit the observatories on certain days. And there are forms to download, fill in, send back and get approved. Typical small island protocol, but understandable as important research is being carried out all the time! There were 20 of us in the group, all English-speaking. Our guide, Kunt, (pronounced Koont) was Belgian. He never stopped talking, which would usually get on my nerves. But the journey was quite hair-rising at times and he had a soothing voice, so he put people at ease as the brilliant coach driver carefully manipulated his way around the bends, often just a cigarette paper’s width from the edge of the road and a long drop downwards! We climbed up into the clouds. Visibility was bad and the road was covered with ice. Icicles dangled like Christmas tree decorations on the bushes. What on earth was the point of building telescopes up here, I wondered. Some of the clearest skies in the world? Surely they were having a laugh! Suddenly we burst out above the clouds into a different world. It was like Brigadoon meets The Sound of Music. I half-expected to be greeted by a group of singing, dancing astronomers, chanting ‘How can we solve a problem like Marata?’! The sky was clear and bright blue. The sun shone merrily and flocks of canaries took off from the small bushes in front of the coach. Although it was bitterly cold, I’m sure that I could have got a suntan as I could feel the heat from the sun. Of course, there was a bloke dressed in shorts with half a tattoo showing underneath. There always is, isn’t there? Duh! We could see all the astronomical telescopes around us. There are 20 of them, owned and run by 15 different countries. There’s a block of apartments where the astronomers, both regular and visiting, stay. They can be allocated 3-4 nights to study a project which they’ve submitted and had approved. All water and provisions have to be transported up the mountain on lorries. We were visiting the world’s largest telescope on the Roque de Los Muchachos. Our guide was waiting for us and we all had to put hard hats on. Goodness knows why. And every time someone raised their head, there was a loud clatter as their hat fell on the ground. It was an interesting visit and the telescope slowly rotated while we were there. The 300 tons of iron and glass sits in a bath of oil, so it can be rotated by hand if necessary. His face was a picture. He looked as though I’d just told him that he was a rubbish guide, or offered him a quick snog round the back! I persevered, and told him that I knew that they did UFO watching there. ‘Do you?’ he replied, giving me a very strange look. Then of course, being in a group, someone interrupted me with their own important question. We climbed back on the coach and slowly twisted our way down the other side of the mountain. Well, there are a couple of helicopter pads there, and it’s a flat area, so enormous UFOs could land there easily, without being seen by anyone down below. Analysing the body language that I saw and felt, I don’t doubt that there are UFOs spotted regularly, and the whole mountain-top community knows a lot about them, but they have to sign some kind of Official Secrets Act. I also don’t doubt that it will all be leaked in the not-too-distant future, probably bit by bit. And when it does, I think that what we learn will be a complete surprise to us all! Travellers from other planets? I’m not sure. Visitors from the future? That’s a possibility. Do they live here all the time, underground? I’m inclined to lean to this theory. Secret flying machines invented by Man? Yes, that’s a strong possibility too! -Or the answer could be several of these theories. Yes, I think so – eventually! Yes it’s well-known that the Nazis were frantically working on building an anti-gravity craft. But I suspect that they may have got the idea from aliens! The Military have managed to keep it a secret for about 70 years if they have built some, & they don’t seem to have used them for anything. The La Palma site is a perfect place for them to take off & land as nobody would see them beneath the clouds. But I’m inclined to think that it’s more than just us humans involved…..
Good article Lyn, well written, factual with humour. Can’t be proved, can’t be disproved. Bit like afterlife, really. Got to experience, but then it’s too late. What do I think? Quite sure that there is life out there, finding our efforts very amusing. But that’s why they are cleverer than we are. They know they exist. We don’t. This is a fascinating article and hopefully we will find out next year about the UFO’s which I’m sure do exist. I shall watch this space. « The Tower that was built by Gustave Eiffel in Paris. A Survivor.